I’ve said it many times in the past, the best way to find great restaurants is from friend recommendations. For several weeks now, J has been bringing up an ice cream parlor in Vicksburg that has come very highly recommended. 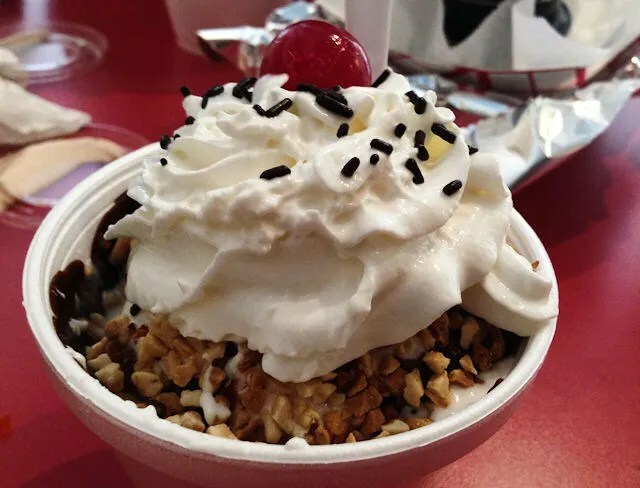 Hell, MLive called it the third best ice cream joints in the state. The problem is, we don’t usually have business in Vicksburg, so any trip to Vicksburg is a special trip just to eat. This past Monday, we had nothing else going on and J really wanted to try it out. 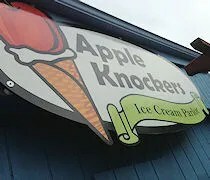 Appple Knockers Ice Cream Parlor is on W. Prairie Street in Downtown Vicksburg. It shares a parking lot with a small pharmacy just outside of the main drag. The building itself is tiny which is pretty common for great ice cream joints. There’s only room for two tables in a very small dining room inside, but there is a counter with chairs looking out over Prairie Street as well as some tables outside on a patio. While ice cream was the main reason we drove to Vicksburg, we also saved this as lunch stop as well. 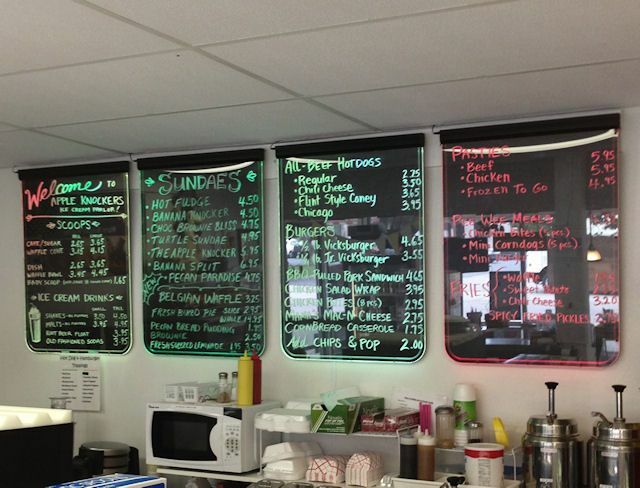 The menu is pretty simple with fresh hamburgers, Nathan’s Hot Dogs, and authentic Pasties among other things. I decided to start with the 1/2 lb. Vicksburger. This fresh meat hamburger comes with choice of toppings on a bakery soft bun. 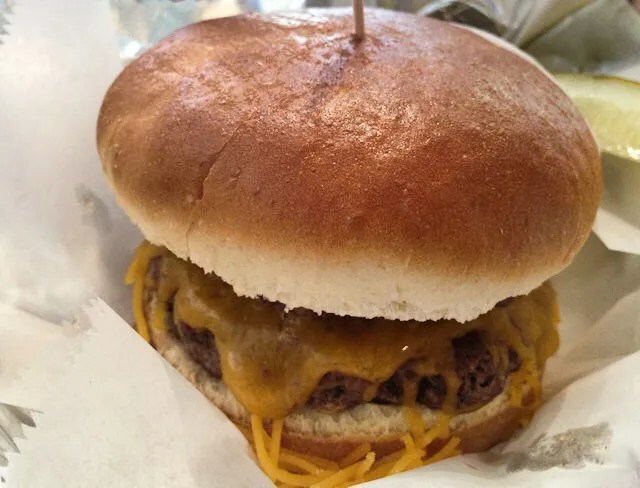 I stuck to just a plain cheeseburger which came topped with what J and I lovingly refer to as “sprinkle cheese.” I didn’t have high expectations for a burger from an ice cream place, but the fact they used fresh meat made for a favorable first impression. 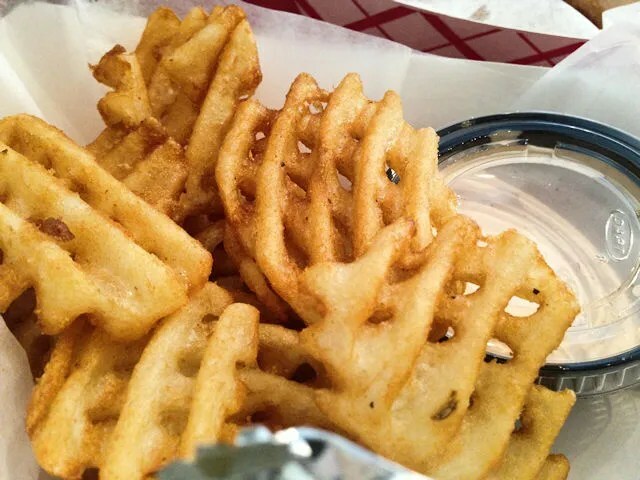 To compliment my my sandwich, I also got an order of waffle fries which come with a small container of “fry sauce.” Before eating at Apple Knockers, J was beginning to wonder if they fry sauce she loved while living out west was really just something that tasted better in her imagination. The few places that have attempted this very regional dipping sauce made of a mixture of mayo and ketchup in Southwest Michigan always disappoints. J said Apple Knockers fry sauce was dead on. We had a couple extra containers with our meals because I don’t eat it and J actually contemplated bringing them home they were so good. 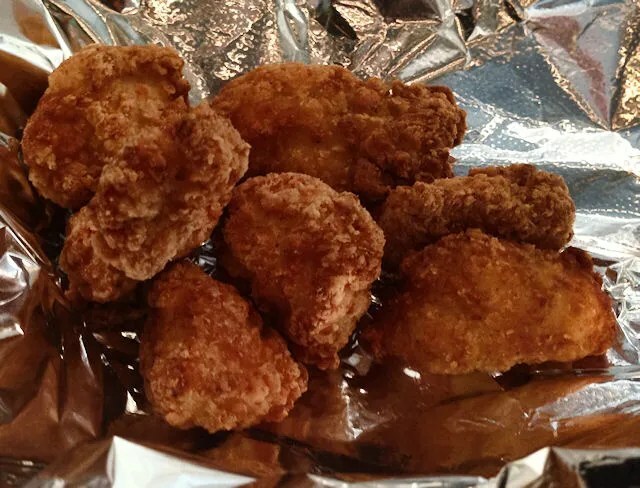 J’s lunch choice was to split chicken bites with L. The popcorn chicken-esque chicken was golden brown and crunchy on the outside, but juicy and moist on the inside. The bites were a little on the small side, but that just left room for more ice cream. The go along with the chicken, J also got an order of waffle fries as well as an order of Spicy Fried Pickles. The whole dill pickle was quartered, battered, and deep fried. 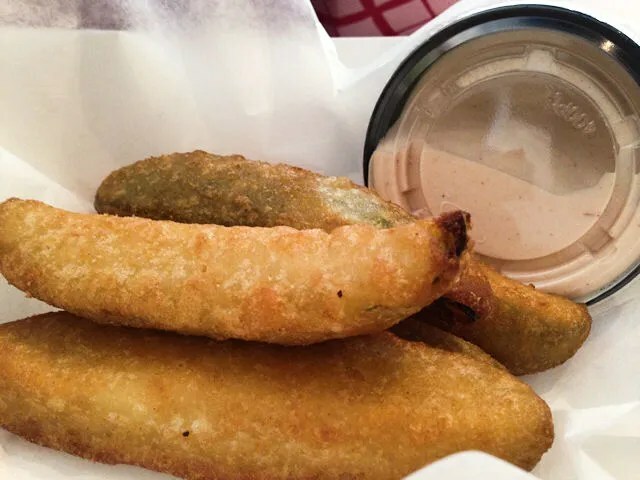 I’m not a super huge fan of deep fried pickles, but J really liked them. They were also served with a container of the fry sauce that J liked so much. After finishing off lunch, J went back up to get us all ice cream. L was given a small vanilla sugar cone and once she figured out what it was, she wouldn’t put it down. The Plainwell Ice Cream was planted firmly on the cone and L couldn’t get the ice cream in to her mouth fast enough. I passed on the shake and the float and ordered the Hot Fudge Sundae. This large bowl of vanilla ice cream was topped off with hot chocolate, whipped cream, chopped peanuts, and a cherry. The sundae was heavenly. Very happy I passed on the simple stuff and went with the sundae. The crunchy peanuts and warm, thick, gooey chocolate against the cold ice cream and whipped cream was perfect on a humid, July afternoon. J also chose a sundae picking the Banana Knocker. 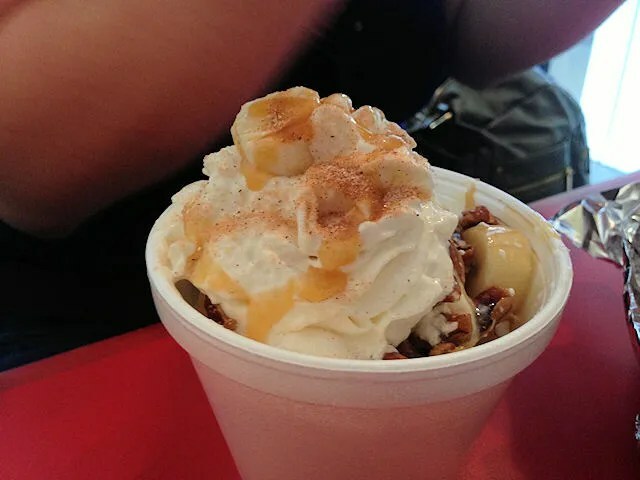 The ice cream on this sundae is topped with bananas, pecans, and a caramel sauce. As with everything else we had today, J really enjoyed this ice cream treat. 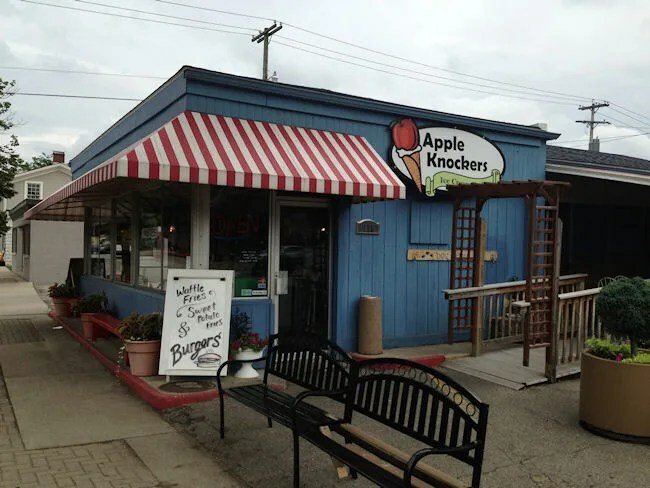 Apple Knockers is a fun little ice cream joint in southern Kalamazoo County with a great menu both on the ice cream and food side of things. All three of us really enjoyed everything we put in our food holes and would (and probably will) be making the trip to Vicksburg for ice cream again this summer. 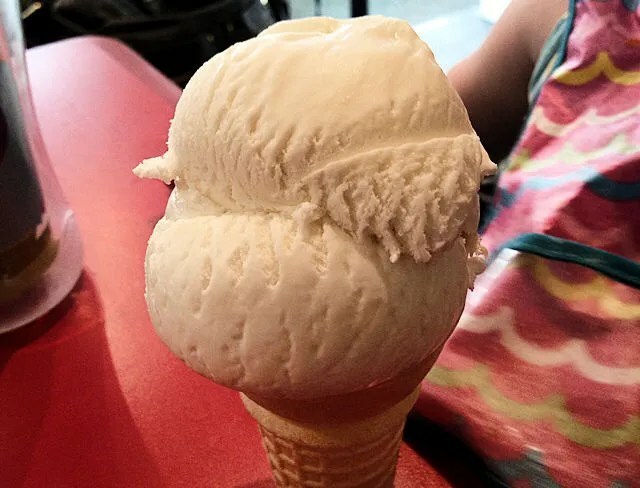 Oh that ice cream looks amazing! Reminds me of The Parlour In Jackson. I will have to keep that in mind, thanks!